This is actually the first Sleek palette I own, even though I did try one out before because I gifted one to my sister a while ago. These palettes have excellent reviews and people seem to love the Sleek shadows, especially the matte ones. It might seem shocking but I'm not a big fan of the matte Sleek shadows. They just seem too muddy and unblendable to me. Maybe it's just user error, I don't know. 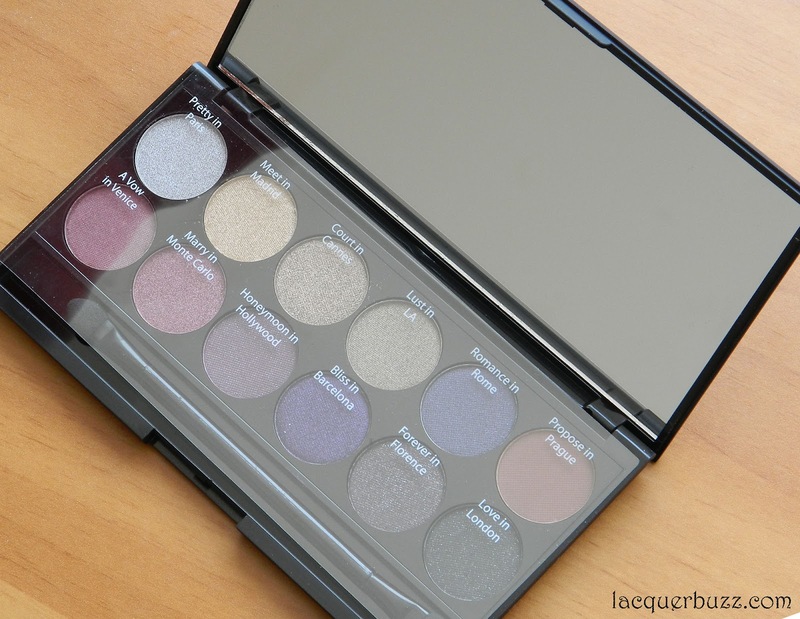 This palette however is mostly made out of satin and shimmery eyeshadows. Here's how it looks. 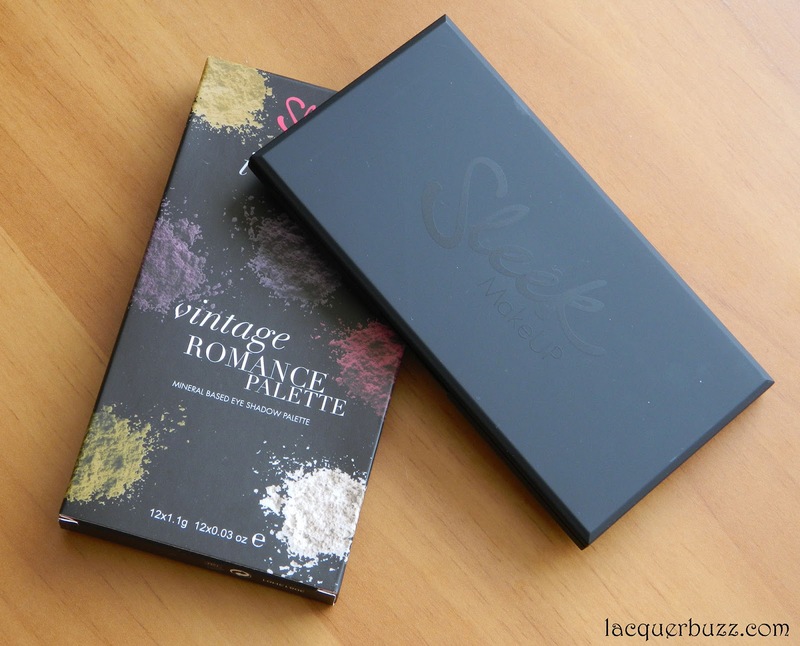 The Vintage Romance palette contains 12 eyeshadows of 1.1 g (0.03 oz) each. The price is very affordable so I think it's great value for money, especially because the quality of the shadows is great for the majority. I wouldn't say that it's perfect, but it's a great palette and I absolutely love it. As you can see above, each shadow has a name that is writen on the little plastic sheet that comes inside. Once you throw this plastic sheet the names will be all gone and forgotten. In case you are a beauty blogger who makes tutorials this is highly impractical because you won't be able to list the names of the shadows you've used. The upper row has a few silver and gold toned shimmery shadows with great pigmentation on the left. The first shade (Pretty in Paris) is a gorgeous light silver that is perfect for the inner corner. Then we have Meet in Madrid, a light gold that is gorgeous and one of my favorite shades in the collection. I've used this on the inner part of my lid as well. The next two shades, Court in Cannes and Lust in LA are gold toned shades of brown with a satin finish. They are perfect for creating neutral looks. Romance in Rome is sort of a dark grey with purple shimmer (it photographed too blue). This is one of my least favorite shades from the palette because it's not as soft and buttery as the other ones. Finally on the far right we have Propose in Prague, the only matte shade in the palette. It's a reddish brown that is not really my kind of color, so it's not one I would use anyway. It has the usual consistency of Sleek matte shadows so it's not that smooth and a little harder to blend. The second row also has some phenomenal shades on the left. There are 3 wine toned shadows called A Vow in Venice, Marry in Monte Carlo and Honneymoon in Hollywood. They are all shimmery but the middle one is extremely velvety and is my favorite one from the whole palette. It's just gorgeous. On the right side of the bottom row there are some darker shades. The purple called Bliss in Barcelona is unfortunately my least favorite shade in the palette. It looks so pretty in the pan and comes out muddy and grey on the skin. It's a shame because it seemed to have such a gorgeous duochrome effect. Forever in Florence is a dark burgundy shade with a tiny bit of silver shimmer that doesn't quite translate on the skin. Finally we have Love in London, a black shade with silver shimmer. 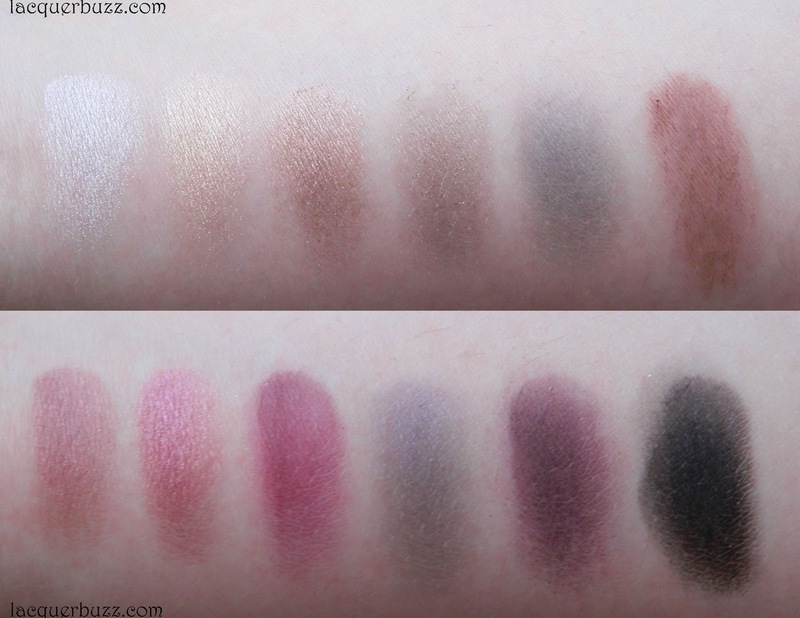 Both these last two shades have great pigmentation and are just perfect for that outer V.
All in all, I love most of the shadows in this palette. There are a couple that I don't really like, but I guess that can happen with all palettes. I've done a bunch of makeup looks with these and I would have loved to show you one but I just can't photograph them properly. I usually use the left hand shadows from the upper row for more neutral day-time looks and combine them with the ones in the bottom row for night-time looks. I'm very happy that I purchased this palette and don't regret it one bit. It's great value for the price and is very versatile, because it allows you to create both neutral as well as more colorful looks. 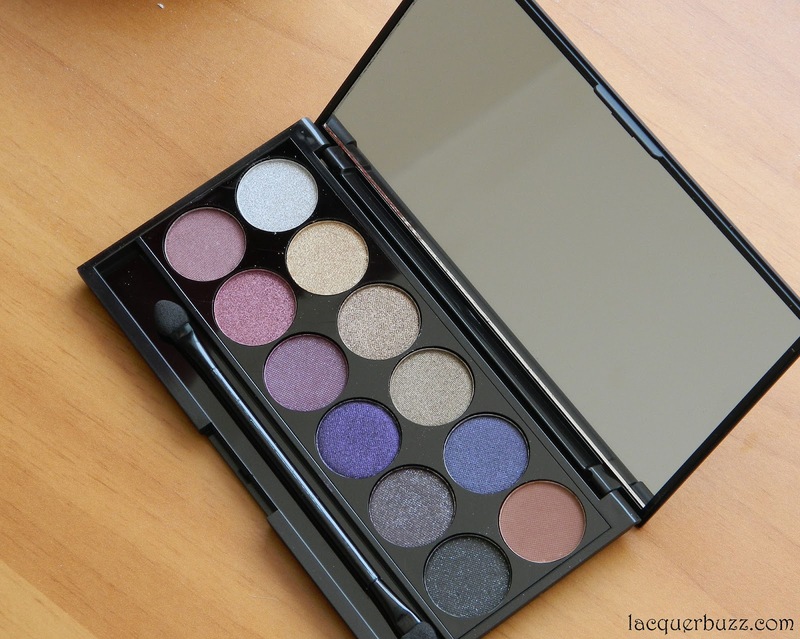 The purple shades are just perfect for the cold season and are a perfect match for brown eyes. Hope you enjoyed my review and thanks for reading! Foarte frumoase nuante! Si eu am o paleta Sleek si sunt foarte multumita de calitatea produsului. This looks like a great pallete!